Do we need a catchy title? I say no. Welcome to the CLAW QUARTERLY, the new printed space for the CLAW artist guild of all that is wacky, art, comic, and prose related, and good in this world. Why printed? Why not a blog or fleeting Instagram story like all the cool kids? I’ll give you several reasons. Those “stories” that are all the rage on social media right now exist for one reason only: to make you check online more often. Because they disappear, they create a sense of urgency for the users. You aren’t feeling pleasure when you catch a live Facebook feed; you are feeling relief that you haven’t missed out on something inextricably linked to all the fake perfect people you see in social media… CATCH THE REST ONLY IN THE PRINT EDITION OF CLAW QUARTERLY! PS: New Newsletter Print Edition coming soon! CLAW MARCH FOR LIFE NEWS..
CLAW Young Illustrator/Cartoonist of the Future Scholarship: Deadline for applications is MARCH 15th (with customary deadline extension to be announced) Download application form here! Washington students only please! Mindy Barker is a muralist who wrangles color and wrangles lines. All for, what she likes to call, “my interventions of urban spaces’. Five years ago, Steve Garvin left corporate accounting to rediscover his creative side. Today, he’s a rebranding expert who helps creative thinkers plan a business they love by tapping into their hidden gold. Michaela Eaves currently focuses on graphite illustrations where animals and creatures cross paths with fairy tales. Occasionally, some of these turn into watercolor and gouache paintings or books. huge thanks to our CLAW President Jennevieve Schlemmer for putting this together, A+ panel host services too! YOU MAY ALSO LIKE: ADVENTURE BOOK OF STRONG WOMEN by Jennevieve Schlemmer now on Kickstarter! 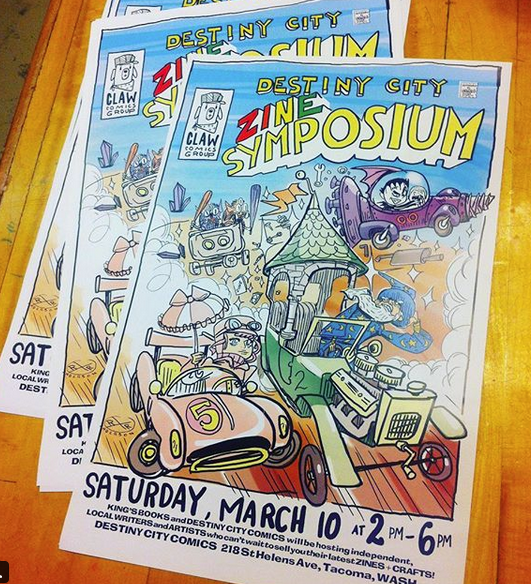 zine symposium at Destiny City Comics MARCH 10TH!!! Member Show And Tell… COME SEE many CLAW members this weekend at ECCC! Or you may have already did that at the time of this reading.. OKAY! 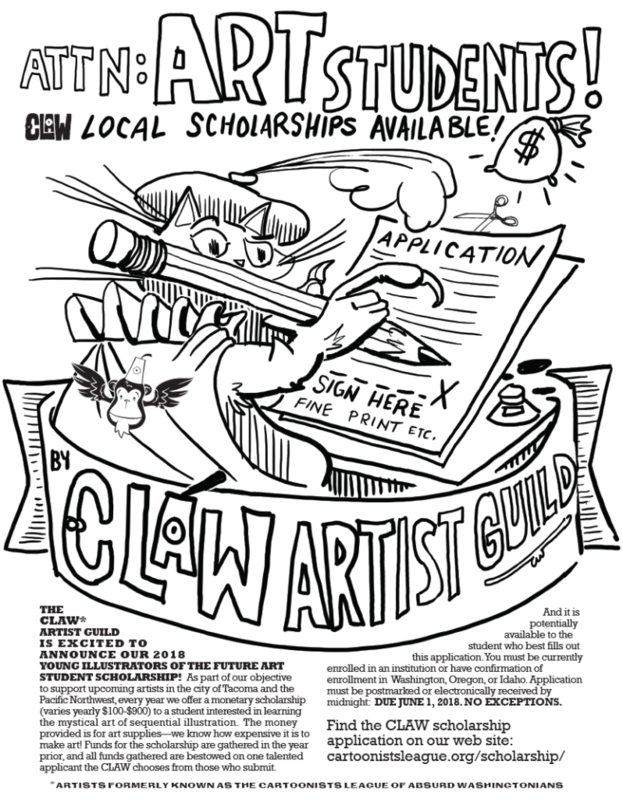 SCHOLARSHIP: Did you know The CLAW likes to give money away for free to young illustrators of the future? Do you like to draw and are you a college art student? APPLY NOW! DUE March 15th! STAY TUNED FOR DEADLINE EXTENSIONS! 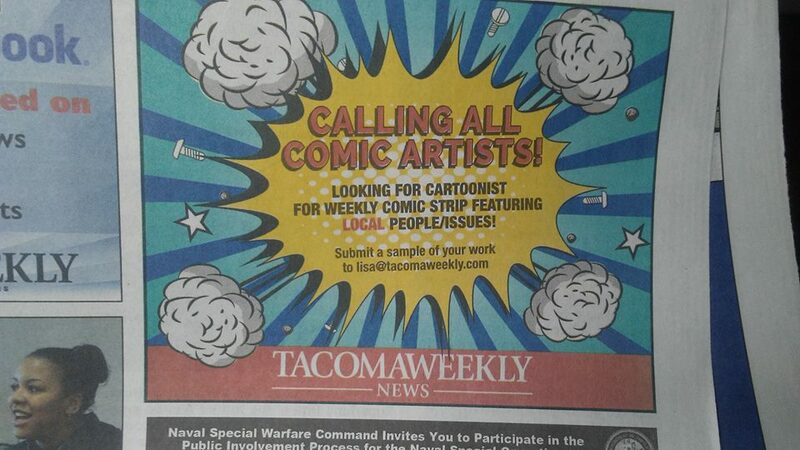 CARTOONISTS WANTED: Our own benevolent force for good, Sonics Guy, spotted this add in the The Tacoma Weekly, I’ve sent in my samples and so should you idle reader! CLAW COMICS NEWSPAPER: Members voted unanimously to start self-publishing a daily semi-monthly CLAW ARTIST GUILD (aka the group formerly known as the Cartoonists League of Absurd Washingtonians) Newspaper. Original articles! Original Comics! Scholarship/Artshow updates! You name it, it will be in there and friends, it will be glorious… like the burning starships off the shoulder of Orion..
CLAW presents Artist’s Best Business Practices! 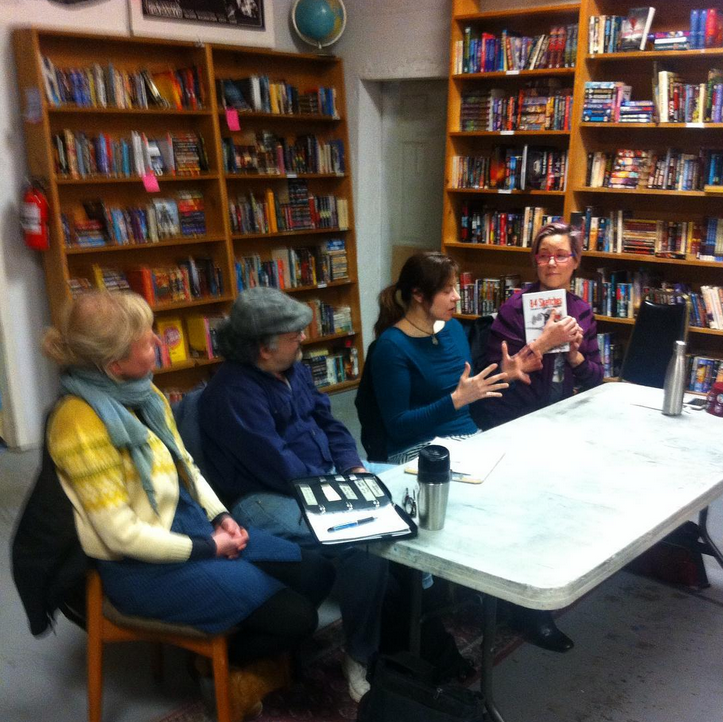 FEB 28 AT KINGS BOOKS… Jennevieve Schlemmer reporting on the scene from king 5 helicopter: “Join CLAW and panel host Jennevieve Schlemmer for an informative and fun panel about what it takes to be a working artist. We will cover best practices for creating a schedule, finding consistency, pricing your work, balancing your books, motivating yourself, and creating your own creative community. Panel includes amazing local artists Mindy Barker, Michaela Eaves, Steve Garvin, and Mark Monlux. Mindy Barker is a muralist who wrangles color and wrangles lines. All for, what she likes to call, “my interventions of urban spaces’. Michaela Eaves currently focuses on graphite illustrations where animals and creatures cross paths with fairy tales. Occasionally, some of these turn into watercolor and gouache paintings or books. Five years ago, Steve Garvin left corporate accounting to rediscover his creative side. Today, he’s a rebranding expert who helps creative thinkers plan a business they love by tapping into their hidden gold. Mark Monlux, Grand PooBah of Monlux Illustration, is freelance illustrator with decades of experience. Since 1985 his art had been on everything from magazines to ice cream cartons. He’s currently doing a lot of graphic recording, storyboarding and whiteboard videos.” Thanks Jennevieve! RR Anderson: COMICS GRINDER was kind enough to feature/review my Tinkertopia Comics on their Seattle blog! Did you know TINKERTOPIA has a digital newsletter? 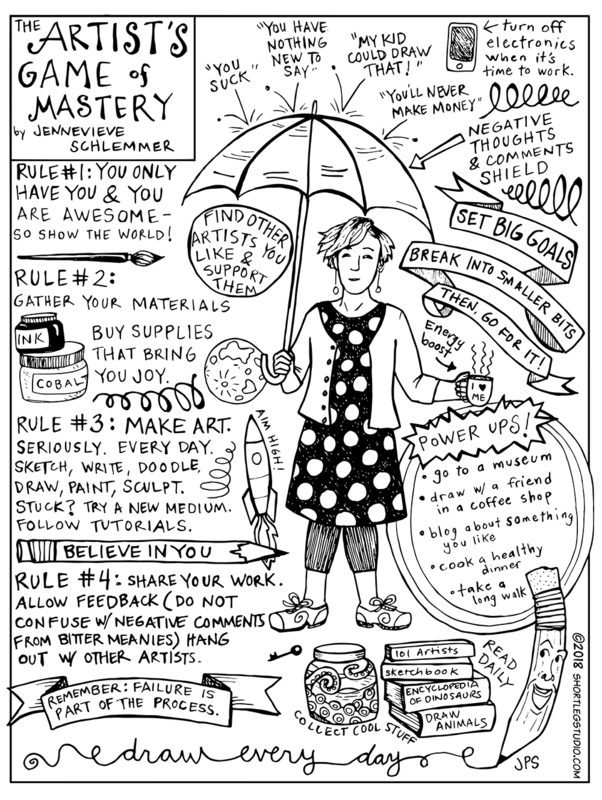 You can subscribe by emailing rerun@tinkertopia.com with ‘subscribe’ in the subject line! ALSO ALSO, did you know we now have a print edition newsletter? Stop by the shop to pick up a copy! Laurence Erhardt: this Claw member qualified to join phi theta kappa. and now here is Corey Macourek with your moment of zen..
Three Second Something: 25 Shoe from Corey Macourek on Vimeo.